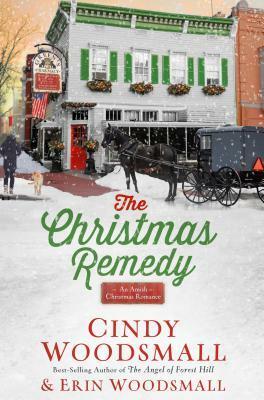 The Christmas Remedy (2018) by Cindy Woodsmall and Erin Woodsmall is a sweet, standalone Amish Christmas Romance. This book comes in all forms including eBook, and is 208 pages in length. With a full-time job and a busy six-year old at home, this book took me two days to read. I received a copy of this novel in paperback form from the publisher, WaterBrook, to read and review. In no way has this influenced my opinion of the story. All opinions expressed in this review are my own. I give The Christmas Remedy 4 STARS. Twenty-four-year-old Holly Zook lives a unique life for a young Amish woman. Years ago, her bishop allowed her to continue her education and become the lead technician for Greene’s Pharmacy, an old-timey drugstore that looks out for the Amish community–a group largely without secure healthcare plans. She knows she can’t marry and hold onto her professional job. She’s Amish, and she can only have one or the other, so she spurns love and works toward addressing treatable diseases–like the one that claimed her father’s life. As long as Holly continues to avoid Joshua Smucker, the one man who draws her like a warm hearth in winter, she should be fine. When something unexpected threatens Greene’s Pharmacy, Holly and Joshua must work together to unravel what’s happened and find the “missing” patient before the Board of Pharmacy shuts them down. As the snows of December arrive, with Christmas in the air, will Holly succumb to the generous spirit of the season? I adore everything Cindy Woodsmall writes. She has an amazing way with writing stories that grab the reader from page one. Independently Cindy’s works are fabulous, but I really love all she has produced with her daughter-in-law, Erin. I have read and greatly enjoyed everything they have collaborated on, and this novel is no different. Together, Cindy and Erin make a superb writing team. If you are in the mood for a well-written, fast-paced, sweet romance, then The Christmas Remedy is the book for you! The heroine of The Christmas Remedy, Holly Noelle, works as a pharmacy tech in a quaint, old-school pharmacy owned and run by a sweet man named Lyle. Lyle is not only a mentor to Holly, but over the years he’s grown to be a father figure as well. At the start of this story Lyle gets sick and it rocks Holly’s world, but because Holly isn’t actually family she can’t legally help him through his illness. Enter Lyle’s estranged son, Brandon. I struggled with Brandon’s character at first. He appears to be the quintessential Millennial so caught up in his own life that his dad’s illness is nothing more than a bother and burden keeping him from the life he thinks he should be living. But slowly over time Brandon’s perspective shifts, and he sees how lucky he is to have a second chance with his dad. Life is so tenuous. We truly have no idea how much time we or our loved ones have on this earth. It is imperative that we make each day count. This means that every day we need to make sure our loved ones know they matter. I speak from personal experience — in the blink of an eye, our loved ones can be taken from us. Do your loved ones know you truly love them? If your mom, dad, son, daughter, or friend died today, would you be confident they died knowing you loved them? This is something worth pondering. While I very much enjoyed my time with this novel, there is one thing Holly says that bothered me. Holly is very dedicated to making sure that her Amish community has access to and understanding of basic medicine and health practices. Her father died when Holly was young from something that could have easily been treated and fixed with the right medical attention. Naturally, her father’s death has left a lasting impression. In a moment where she is passionately defending her near-obsession with her community getting proper medical care, Holly explains that “life is serious…people who take it lightly are more likely to die before their time” (81). I take issue with this notion that people die “before their time.” People die young, and that seems wrong to us. People die viciously, and that seems wrong to us. BUT no one dies before their time. In Psalm 139:16 (ESV), David writes, “Your eyes saw my unformed body; all the days ordained for me were written in Your book before one of them came to be.” Before we were ever conceived in the womb, we each were seen by God. He wrote our entire story in His book. Every single day we have here on earth has been penned by God. My problem with saying someone has died “before their time” is that it implies that God is not in control. God is 100% in control, and Psalm 139:16 proves this. My issue isn’t really that Holly says this. She is 20 years old. To a 20 year old, any young person dying feels like that person has gone too early. My problem is that this line of thinking never gets corrected. I kept waiting for a wise man or woman to correct Holly’s theology in this case, but it never happens, and to me this is a little disappointing. Overall, I really enjoyed my time with The Christmas Remedy. I very much loved the unique and endearing characters, and the story line is quite engaging and fast-paced. And, I enjoyed the sweet romance weaved through the story line. I very much recommend this enjoyable novel.